Hey everyone! I hope you all had a great summer and can come back to the school year feeling refreshed! To start the school year off I decided to write about the best online tools for studying. These websites can be used by all students on whatever kind of technology they have – desktop, laptop, or tablet. Making flashcards and study guides online is such a good idea because it keeps students organized, saves time, and lets students collaborate with other people in their classes and even their own teachers. Did I mention they’re all free? This is a website that lets students easily create their own study materials. Best part is- you can sign up for free! 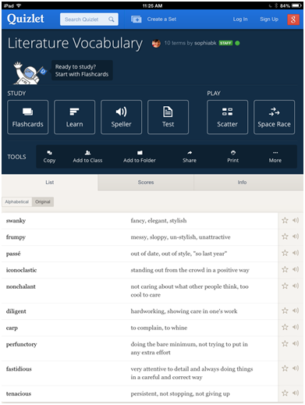 To save time, search from the many pre-made sets of flashcards. They offer tons of materials for all subjects- math, English, foreign languages, vocabulary, science, history, etc. There’s also a section for standardized tests such as the SAT’s, LSAT, and GRE. Another cool feature is the career section which has flashcards and quizzes for vocational terminology, such as medical terms for medical students. This could be helpful for college students brushing up on terms for a practical exam or internship. I always tell my students about this site to check it out! It’s also available as an app for Apple products and Android. This site starts by pretesting you to find your vocabulary level and from there builds on your level of knowledge. They use only the most important vocabulary words that are often seen in literature, academic tests, and real world working environments- sounds good to me! 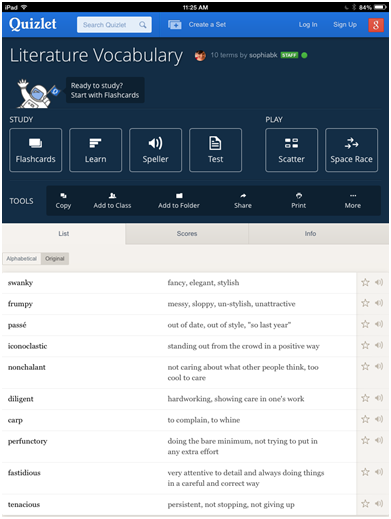 The part I like about Vocabulary.com is that it doesn’t just throw vocabulary words at you once (which you’ll probably never remember again); the site builds a list for you and will re-quiz you on words until you master them. That way you can actually learn the word by seeing it many different times in different contexts. This is a useful site for students from junior high to high school. Another awesome site with tons of study materials. From online courses and teacher resources to student study guides and quizzes, this site has an impressive list of free material. I recommend their study guides to my high school students because they summarize the info in a way that’s easy to understand. To use – search the subject (biology) and then find the concept the class is covering (say cell reproduction for instance). From there you can choose from study guides, study questions, key word definitions, and quizzes. Love this site! If the study skill websites above don’t suit your needs try StudyBlue. Similar to the sites above, this site lets users make their own flashcards, take online quizzes, and search for premade resources in various categories. The cool part is it also has a portal for teachers to put material online. So students can go on and find study tools that their teacher made for their specific class. One of the best features is the study reminder you can set to notify you with a reminder to study. For easy studying wherever take it on the go- it’s available as an app for Apple and Android products. Let us know what sites you find helpful! Sign up for our mailing list here to stay updated with our latest therapy tips, app announcements, and blog posts. Don’t forget to follow us on Twitter, Pinterest, and like us on Facebook!